Sportscar Vintage Racing Association (SVRA) today announced one of the greatest icons in the history of motor racing will serve as Honorary Chief Steward for its Father’s Day weekend (June 14-17) Brickyard Invitational at the Indianapolis Motor Speedway (IMS). Three-time Indianapolis 500 champion Bobby Unser will return to the scene of his most legendary triumphs from a sterling career. 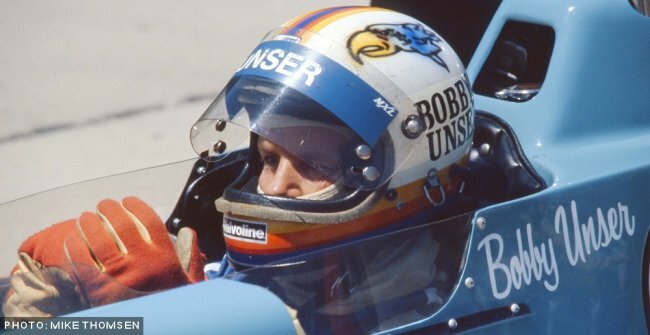 Unser, affectionately known as “Uncle Bobby” to many in the sport, won the Indianapolis 500 in 1968, 1975 and 1981. He also captured the national driving championship in 1968 and again in 1974 with a career total of 35 race wins and 52 poles. Known as a versatile talent, the International Hall of Fame driver won the 1975 International Race of Champions (IROC) series and scored more Pikes Peak Hill Climb victories than anyone in history. A proven winner in sprint cars and midgets, he also competed in NASCAR, Formula One, and sports cars. An outstanding development driver, Unser is credited with much of the input to the design of the “Gurney Flap,” an integral element of racing wings. He was also vital to the development of the first in-house Penske chassis to win the Indianapolis 500. In the Brickyard Invitational weekends of 2014 and ‘15, Unser led the event’s oval exhibition races and will play a role in that feature this year. The Indy Legends Charity Pro-Am is the Saturday feature event of the Brickyard Invitational. A field of Indianapolis 500 veterans will be in 1963 to 1972 vintage Corvettes, Camaros and Mustangs of SVRA “Group 6” A and B Production. The professionals will be paired with amateur drivers, splitting their stints at the wheel. The entry list for that event includes such top names as Al Unser Jr., Paul Tracy, Jimmy Vasser, and Willy T. Ribbs. Additional Indy 500 drivers will be announced as they enter in the coming weeks. In addition to the Pro-Am, there will be a festival of other activities at the Brickyard Invitational including the Sunday, June 17 feature race by the professional Trans Am series headed by 2017 champion and emerging superstar, 20-year-old Ernie Francis Jr. The Hagerty Insurance “shine and show” car corral is also returning, along with vintage motorcycle racing, and 500+ vintage racers ranging over 100 years of automotive history racing in SVRA Groups 1 through 12. An oval exhibition featuring a race car show of judged competition for the A.J. Watson and Sir Jack Brabham trophies led by track historian Donald Davidson will also take place. The weekend is also the second of three stops for the Pre-1920 Exhibition Series during the season. The first is at Sonoma Raceway in June and the third at Watkins Glen in September. The Pre-1920 cars involved are extremely rare, in some cases the only example in existence. Long retired brands including Mercer, Packard, EMF, and Locomobile are part of the series. The National that finished seventh in the first Indianapolis 500 in 1911 is entered. These unique and amazing machines will be part of their own run group so, these are not static displays, they are real, running machines. Those machines will also have a special paddock corridor with in-period tools, spares, and other equipment on exhibit. Drivers and riding mechanics will dress in the apparel of the early days, including leather helmets. SVRA sponsors Jaguar and Land Rover will also be on hand to present arrive and drive experiences. Anyone with a valid driver’s license and closed-toe shoes can drive the cars. Professional drivers will coach fans that want to challenge their skills and feel the performance of a Jaguar F-Type on a certified autocross course.